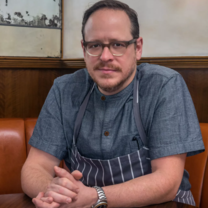 Damon Wise is the culinary director for Linton Hopkins’s Resurgens Hospitality Group. A Baltimore native, he got his first taste of fresh, seasonal ingredients during childhood summers on the Chesapeake Bay Shore. There he enjoyed seafood caught that day by his grandfather and just-picked produce from his grandmother’s garden. "Still dreaming of our epic meal @#badass"
"I am really bad at taking pictures in a low lit room. But I have to give props for the fantastic experience I had @#realgoodrealthoughtful"
"Yep. Big. Lunch. lewisbarbecue you tried to kill me but I survived." "A bowl of sunshine. Thank you @huriyali"
"I love the rotisserie-crisped beets with bulgur salad, apples, and creamed horseradish. The char from the beets and the horseradish are so delicious." "Momofuku Ssäm Bar's kimchi encompasses flavors of fall and winter. This dish gets you excited about the possibilities of the cold season to come."